Capitalism! The American Dream! Except that what we believe about capitalism, and how it actually works, are two different things. We’ve been told that the essence of preserving the economy involves making things better for the wealthy, so that they will make bigger companies and hire more people for more jobs, and thus the crumbs of their good fortune will “trickle down” to the rest of us. Except that it’s not true; wealthy people won’t part with their wealth unless regulations force them to. We are told that the American Dream rewards the hard-working and the worthy, and that anyone can succeed if they try hard enough. Except that it’s not true; people in poorer countries are more entrepreneurial than people in wealthier countries, and good infrastructure is the key to building the wealth of nations. We are told that you must pay good CEOs and Directors of large corporations top dollar so that you will get the best. Except that it’s not true; Board Directors often make decisions that are best for them in the short term, and really bad for the company itself in the long term (fancy that!) And by the way, you’re probably wrong about how much they’re getting paid. Most people think it should be about 10 times what the average worker in their companies get paid, and they think it’s actually more like 30 times. But they’re wrong; it’s really more like 300-400 times as much! We are told that what’s good for the shareholders of a company is good for the company overall. Except that it’s not true; shareholders want to buy low and sell high, and quickly, and that means that often decisions are made in companies to cut corners, cheat, and patch instead of fix, until the whole structure collapses. Like with pretty much every automobile company you’ve ever heard of, and several large airlines. We are told that the free market economy is the best way to handle things, because market forces will ultimately balance everything out. Except that it’s not true; there is actually no such thing as a “free market economy;” governments and corporations fix the conditions of the market all the time. So could we; and so we have in some ways, which is why “fossey jaw” is a thing of the past. We are told that education is essential to the future wealth of a nation. Except that this isn’t true either; there’s almost no correlation. What drives the wealth of nations is actually manufacturing. Don’t believe me? That’s okay; Ha-Joon Chang is a Cambridge trained economist who has won prizes for his work, and he’ll tell you better than I can, with figures to back it up. And he’ll explain it in a way that even an arts major like me can clearly understand. I can’t say enough good things about this book! If you, like me, see the rot at the core of our economic system but you lack the words to tell people why it’s rotten, this is the book for you. If you don’t understand economics and you want to learn without taking a course, this is the book for you. If you think that capitalism is the best thing since sliced bread, and you think lefties are wingnuts who don’t understand how the world really works, this is still the book for you because you can acid-test your theories against an educated dissenting opinion. I wish that my Prime Minister would read it because I think he would run things a little differently if he did. Over the next couple of months I’ll be writing an extended series focused around the theories presented in this book on Gods & Radicals if you want to know more. I thought this book was outstanding. It was deep, thoughtful, and marvelously subversive, and like all good science fiction, it makes you think. A bunch of people in a far future on a distant planet with some superpowers establish a society that they model consciously after Vedic civilization (it never says why or how, but there is an assumption that most of the people are Indian). For some reason (again never fully explained) the people do not start out with the levels of technology of their ancestors; somehow it has been lost. They discover the people with the superpowers and start to treat them like gods. The “gods” divide into camps. Some take the fascist view that since they can do things that others can’t, they *are* gods and worship is their due. Others (the minority) take the position that they need to help people to rediscover the technology they lost, and if they *must* be seen as gods, they will use the press to further that end and then “resign” their positions and disappear into myth. Sam, our protagonist, consciously uses the legends of the Buddha to that end. Some have commented that they don’t understand this novel, or that it reads more like fantasy. It’s intended to be read that way, and to someone with even passing familiarity with Vedic mythology it’s brilliant. The characters who assume the roles of “gods” speak to each other and their “worshipers” with a weird mishmash of pseudo-archaic-speak that can’t possibly be anything but affected, which is downright funny. Much of their “miracles” are also due to extremely advanced technology. The technology used to justify their Ascension is extremely loosely described by design and might just as well be magic for the reader’s purposes. The author explores many deep themes of religion. He asks us to consider the nature of what a “god” actually is. Gods get to be gods in our myths because they are immortal and they can do amazing stuff that the rest of us can’t. So at what point does that become true? I have read numerous dissertations that theorize that superheroes are modern stand-ins for Pagan deities (Superman = Sun God, Wonder Woman = Moon Goddess, Batman = God of Vengeance/Justice, etc.) If they can do things that we can’t, and they’re effectively immortal, aren’t they *actually* gods? If not, then how do we justify our gods being gods in the first place? Perhaps the gods we are familiar with were just people who can do things that we can’t. If it’s because they’re more “enlightened” than we are, how do we know that? Maybe they’re con artists, like Sam, who says all the right things but doesn’t believe them himself, until an enlightened “follower” shows him that the words of the Buddha that he’s aping do actually have truth. And furthermore, many gods in mythology behave just like us, only they do more damage when they do stupid or mean things because of their powers. (And that’s every god ever, from Thor to Zeus to Jesus to Jehovah himself). Is religion a good thing or a bad thing? Is it a necessary part of human development? Is it something that we “transition out of” when we grow up as a species, or is it something that we always need? Which gods are the “real” gods anyway? Some have wondered if this book might be disrespectful to Vedic beliefs. I can see that some might find it so, and considering that when the book was written no one would have thought twice about it because it wasn’t Christianity, Judaism or Islam, that’s progress. But I don’t personally find it so. For the record (full disclosure) I am a rather devoted Wiccan Priestess who has written books and keeps a blog on the topic, and I’m sympathetic to the Vedic deities because a) Hinduism and Paganism are very similar in many ways, b) some modern Pagans worship Vedic deities, and c) many of us dabble with Buddhism as well because it also has a lot in common with contemporary Paganism. So understand that I take these deities very seriously and have the highest respect for Them. But this is no way invalidates the issues being raised by the author, who is challenging and exploring the nature and necessity of religion as a whole. Is religion something that holds us back as a species, or does it inspire us to greatness? Is faith the only thing that keeps the darkness within human nature in check, or is that only our mortality? What kind of horrors would we get up to if we weren’t limited by human frailties? At the time Lord of Light was written, science fiction extolling the virtues of human ascension through technology were common. Zelazny, with a combination of cynicism, humour, respect and love, suggests that no matter how advanced our toys and powers become, we’ll still just be people and we’ll still act like it, for good and for ill. I found myself contemplating those figures who were said to be divine incarnations throughout history, such as the Buddha, or Jesus, or Zoroaster or Pythagoras, and I find myself wondering if they, as Sam does in this novel, originally established their following as a protest *against* the gods and those who claimed to speak for them. The Buddha was protesting the Vedic caste system; Jesus was protesting the Pharisees. Did they intend to become objects of worship, or was that a corruption of their original message? More than the religious issue, however, Lord of Light can be read as a powerful anti-capitalist message. What starts the conflict between Sam, the handful who join him, and the rest of the “gods,” is that a new merchant class takes over the Wheel of Karma (the technology that allows people to transfer to new bodies when they die) on behalf of the “gods,” who direct them to only permit people to reincarnate if they’re doing the things that the “gods” want them to do, which they get to make up arbitrarily. They encourage the populace to labour for them with lesser technologies than they might receive, and destroy their works whenever their civilization discovers a higher level of technology than the “gods” wish them to have (such as the printing press) by promising that those who are pleasing to the “gods” might reincarnate into better positions when they die. But the “gods” and the Lords of Karma make up the rules to suit themselves and secure their own “divine positions,” so who really gets to advance? Free thinkers are also punished by being reincarnated as apes or dogs, for example. In this I see the message we are told by the 1%; we are all just temporarily embarrassed millionaires. But who really gets to advance, and by what rules other than toeing the party line? Not only does this story contain all of that, but the allegory is a lot like “American Gods” or “Gods Behaving Badly”, and it’s a funny and sympathetic look at the human condition. Highly recommended! If you missed it, check out Part 1 of this Report From Greece. (Capital vol 2, p. 117 of the Penguin edition). An Athenian anarchist friend suggested that we should go to a demonstration in Syntagma Square called to protest Syriza’s willingness to sign a new memorandum with the “troika,” although we have as yet no concrete knowledge as to the contents of the new Memorandum. Since the whole affair is being presented in the form of a soccer match, why shouldn’t another team enter the field? Perhaps they will score a surprise goal! But at the moment all eyes are on LeGuard, Draghi and the faceless IMF “technocrats” versus the heroic Tsipras, who delays by putting ever higher bids, and rolling the debt one time more until it is time itself that becomes the issue. 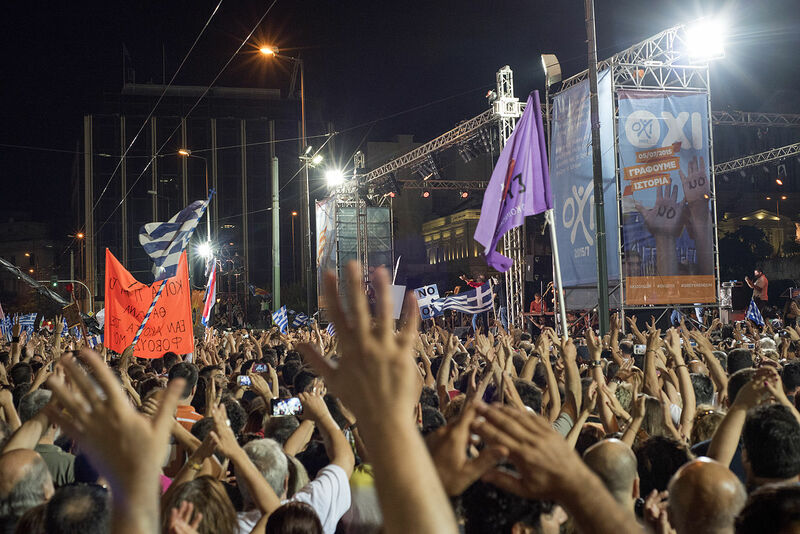 3 July, 2015: Greek referendum 2015: demonstration for voting NO at Syntagma square, Athens Greece. Photo by Ggia (CC BY-SA 4.0). Well, in Syntagma Square the initial rally was small—with predictable statements. But soon it was joined by another demonstration that marched to Syntagma from another part of the city and so the whole rally numbered about a thousand (respectable by NYC standards, but very small by Greek). The groups sponsoring the march and rally included, anarchists, autonomists, and even some Trotskyites. Sure enough I saw an old friend who happened to be a well-known Greek Trotskyite. We would see each other often in the 1990s in NYC, but he stopped coming to the US after 9/11, while my political affiliations in Greece became more defined in the post 9/11 period as well. To the point that we hadn’t seen each other in a decade. During that time he had a bout with liver cancer involving many surgeries and chemo-therapy sessions. The cancer would have killed him if it hadn’t been for his decision to go to France and get medical help there. The decision was motivated by another decision of the Greek medical authorities who ordered an anti-cancer drug for him that was needed immediately but with a 3 month expected time of delivery! The French doctors declared him cancer-free a few years ago, but he must return to France every 4 months to check his status. My Trotskyite friend prided himself on the books he wrote and the political campaigns he was involved in while in the midst of his treatment, as he should. And now he wants to live to be part of the international working class revolution! The march was beginning again, going down Panapistemiou St. My Trotskyite friend took his place at the end and was off! At first there was a small circle on the square, but it grew over time. At first it was mostly an older crowd, but slowly younger people joined. The intention is to call for a new decision-making body based on popular assemblies to replace the Vouli (the Parliament) that was de-legitimated by the actions of both left and right parties. One speaker after another noted a discrepancy between the extreme situation being faced and the lack of any force from the bottom to intervene! However, only one woman spoke and she addressed a logistic question: how long should each speaker be allotted, 3 or 5 minutes? There ought to be a movement of the Syntagma Square 2015, but it remained just that, an ought. On Saturday morning I woke up in Sparta and looked out from the hotel balcony down Paleologou Street and saw that there were lines in front of the ATMs. I wondered what this was about. On going downstairs for breakfast I learned that the night before Tsipras and his advisors walked out of a meeting with the “troika” and called for a referendum on the question, should the final memorandum the troika offered be accepted or not? The immediate response by the Greek populace was this minor “run on the banks,” minor since there are limits as how much can be withdrawn from ATMs per day. We shall see what will happen on Monday when the banks will be open for business. Will this minor run become a massive charge on the banks’ reserves? There was definitely a feeling of panic spreading on the lines in front of the street. I also felt it. I was prompted to take out extra euro cash (in a classic bow to Keynesian “liquidity preference”) because, though I would simply be contributing to the banks’ reserve of dollars, I too would be impacted by the lack of euro currency that would inevitably be experienced by some of the weaker banks (if not the whole banking system, if a “holiday” is called by the government). This “preference,” however, has a primal feel about it: contagious, violent, irrational. A condition typified by an audience fleeing a minor fire, crushing each other to death trying to get to an exit! A small businessman’s Abrahamic statement? Heard from a taxi passenger: When I flew in from Frankfurt to Athens I was very tired (it was night) so I decided to take a cab home. As I got into the cab I noticed a sign saying, “Flat Rate to Athens 35 euros.” So I settled back to enjoy the ride, but I was getting a little worried (as we were getting close to home) that he might short-change me. Sure enough, when we got to the door of my house I handed him 35 euros, he said, “It is 50 euros.” I began to protest and pointed to the sign. He said, “Thirty five euro is for the day, it is 50 euros for the night.” I said, “The sign said nothing about night or day.” The driver said, “Well, let’s go to the police station to straighten this out.” I didn’t want to go to the police station, but nor did he. So I said, to break the stalemate, “Let’s settle this with fists!” He laughed and said, “The 35 is o.k.,” and off he went. 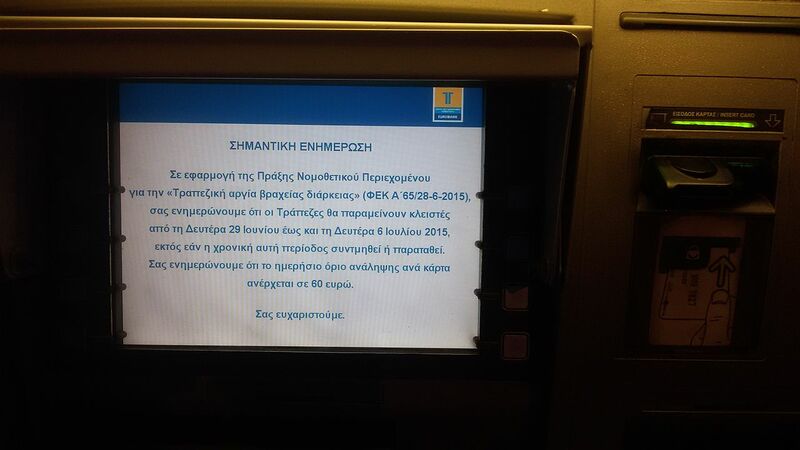 Message appearing on ATMs following the announcement of Greek bailout referendum. The message informs about the closure of banks from 29 June to 6 July and the 60 euro withdrawal per day per card. Photo by SucreRouge (CC BY-SA 4.0) . I am in Agios Dimitrios in the Mani with comrades from Switzerland, writing this on a terrace overlooking the Messenian Bay, it would seem I am in the midst of Paradise, without a care in the world! But I write this also on the first “bank Holiday” in Greece in many years, i.e., the government has ordered the banks to be closed and to distribute cash to depositors at a rate of 60 euros a day through ATMs. What a strange name for this day…a holiday. What god is being honored, if not the God of Banks: the money form? This god presents itself as the universal mediator between non-coincident desires, but these days it is becoming an angry God that is denying all desires (coincident as well as non-coincident). So that capitalists are looking for cash to make more cash and the rest are looking for cash to keep body and soul together. This is the first day that the debt crisis has hit the immediate lives of Greeks (and even visitors). The long queues in front of the ATMs tell the tale of anxiety and panic…but even worse is the lack of queues, indicating a machine that is out of cash! I too am caught in this anxiety and panic, though to a lesser degree, because I can get as many euros I want from the ATMs, but I need to find one that is functioning and has cash. This is increasingly difficult since, most crucially, this availability depends on the euros lodged in the banks as cash! A system of exchange of commodities is becoming a non-system of non-exchange of non-commodities, leaving in its wake gift exchanges and gratis offerings. What was considered a solid way to solve the problem of non-coincident desires has vanished into air, but it also has an escape hatch. Like the staircase from the inferno to purgatory, it takes time to get to and climb. The Syriza people seem to have the intention to do this without a Virgil. Such a trick is unlikely to succeed unless they are expert secret keepers or master game theoreticians! That we shall see, when this holiday in Paradise ends. “Vox populi, vox Dei,”[“The voice of the people, [is] the voice of God”] is a phrase from a letter written by Alcuin, an advisor of Chalemagne’s who was an early “founder” of the Holy Roman Emire and often taken as the founder of Europe. In the letter Alcuin warns the Emperor not to pay heed to those (like myself) who use the phrase affirmatively. But if the adage is true, what is God saying through the July 5th, 2015 referendum in Greece? That has much to do with what the question being voted on. A protestor outside the Greek parliament building on 29 June 2015, holding a sign reading “ΟΧΙ” στην ΕΞΌΝΤΩΣΗ (“no to annihilation”). Photo by janwellman (CC BY-SA 3.0). As some critics pointed out, the referendum question had no proper answer, since the “troika” had already taken the memorandum “off the table.” So the vote came down to what the voter wanted it to mean: e.g., “No more pension cuts” or “End austerity policies” or “Greece out of the Eurozone” or a thousand other critiques of the present or nothing precise at all or anything Tsipras and Syriza want it to mean. The referendum’s wording made God speak ambiguously that Sunday through the Greek people’s voice. In trying to make sense of the peculiar wording of the referendum I saw not so much game-theory in action but a Machiavellian aspect of Syriza, a failed Machiavellianism, however, since Machiavellian reasoning in politics is defeated when it is identified as Machiavellianism! First, the call for a referendum appeared to be a spontaneous response to the troika’s stony refusal to accept some milder structural adjustment measures and a reduction of the debt payments schedule at least. But I learned that the call for the referendum was discussed for months before, within the inner circle of Syriza. So the wording of the referendum was not a hurried decision made in a fit of anger and frustration. The second Machiavellian point was Tsipras’s claim that an “OXI” vote would give him more power to negotiate with the troika. In other words, the heat of the voter’s insurrection, their gigantic “OXI,” would be useful in frightening his negotiating partners. The attempt to use the anger of Greek workers–who have been degraded on many levels since 2010 and given an avenue for its expression by the referendum—was problematic, since once it is expressed, it cannot be withdrawn. Many said that they voted “OXI” simply because of their refusal to be terrorized by the fears unleashed by the propaganda of the media. This is not a sentiment that can be turned on and off for the benefit of IMF bureaucrats and hedge-fund capitalists. The third Machiavellian point is Syriza’s refusal to make preparations for taking Greek monetary transactions out of the Eurozone. This was not a technical matter but would have involved the education of the proletariat, capitalists and state employees in the consequences of changing currencies. Even a simple thing like having a few trucks filled with the currency of a possible future money system would have done a lot to “concentrate the mind” of wageworkers (after all, most capitalist-to-capitalist money transactions, outside of the drug trade, are not done in cash). The decision confused both the troika and the Greek working class. The denouement of this failed Machiavellianism could be seen in Syriza’s proposal sent to the troika five days after the referendum. 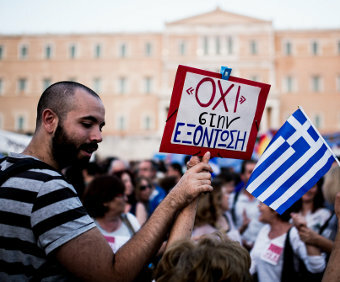 In that period the voters’ “OXI” was supposed to have shaken up European capitalism, but that did not happen. Neither the exchange rate for the Euro nor the major stock markets of Europe crashed. This lack of response spoke volumes in a language that neoliberals understand. So Tsipras presented the Syriza government’s proposal to the troika on Thursday, July 9. It turns out that this proposal is similar to the memorandum Syriza asked Greeks to reject in the referendum. Liz Alderman, in a nice piece of journalism, compared Tsipras’s and the “troika’s” proposals and she found little difference, e.g., the two proposals with respect to taxation are identical as were the proposed changes in the pension system. Ironically, the major difference was in mililtary spending. The troika’s proposal asks for 400 million euro cut while the Syriza proposal asks for a 100 million euro cut this year. The situation in Greece manifests a double crisis: the crisis of capitalism in Europe, as reflected in the politics of the German Government, and the crisis of the European working-class and the European left. The politics of Syriza should be de-personalized. They have mismanaged the negotiations but their options were limited given that neither they nor the Greek people ever seriously considered leaving the Eurozone and, for example, turning to Russia for loans. The European Union has become a fetish for the Left, the ideological campaign of ‘Europeism’ has been successful, generating among most a great fear at the idea of leaving the Eurozone. The Marxist autonomist Left is guilty of the same disease. The formation of a Eurozone has been hailed (to this day, see the recent conference on the crisis in Athens) as a terrain of working class re-composition, but actually we have seen that this has not been the case. Greece has confronted the battle with the European central bank and Bruxelles by itself. No mobilization, no significant expression of solidarity has cone from other countries. This lack of solidarity is especially worrisome, since the working classes of Europe have faced a decade and a half of austerity and structural adjustment and should know the implications of the disciplining of Greece. By 1998 the EU had imposed on all its members a “Stability Pact” that prevented them from having deficits larger than 3%, forcing them to practically stop all payments, so they could not pay the companies that had been working for them and who eventually went bankrupt. In Italy even victims of an earthquake in Emilia could not be helped explicitly because of the budgetary limits even though the municipalities where the earthquake occurred did have the money necessary. Yet, there were no large demonstrations in London, Paris, Madrid, Rome or Berlin supporting the insurrectional “OXI” vote as a harbinger of their own rejection of austerity. Even in front of a massive media attack stressing among other things that other workers in Europe would have to pay for the Greek debt. From a class perspective the crisis, however, is (a) the lack of coordination and solidarity among European working classes; (b) the inability of European working class to delink from capital and the political class, despite the obvious attack to which it is being subjected which will be generalized and intensified in years to come if the TTIP (Trans-Atlantic Trade and Investment Partnership) is realized; (c) the inability of the European left to distinguish between the Europe of the bosses and the Europe of the proletariat and its commitment to a Europeanism that is suicidal, preventing a ‘rupture.’ If Greece had left the Eurozone, it could have triggered a real process of re-composition, instead of being used to discipline all the workers in the other countries, who every night have been reminded of what can happen to them if they step out of line, and reject the reforms imposed on them. The only bright spot is the referendum, which was the first loud NO to globalization in Europe and, as some have noted, a Latin American moment in European class politics. The No! of Greece could have also begun a confrontation with EU politics that is now redirected against immigrants, as the case of Italy demonstrates. Unfortunately only the right wing in Europe now speaks against ‘Europe’. different localities, forcing municipalities to accept a certain number, but now citizens are revolting, and the right-wing is fomenting the revolt. More immigrants continue to die. The rightwing calls for a naval blockade, to push them back and tells the government that to save them is wrong, because more will come. They say the government should give no assistance. In reality this is what is actually happening. France has closed the frontiers. Syriza’s refusal to prepare the working class in Greece of what an alternative to continuing with “humiliating” negotiations with the troika has been widely noted. This observation was even more problematic to those trying to understand Syriza’s strategy, since only if there was a credible threat to carry out a successful exodus from the Eurozone could have the Tsipras-Varoufakis team have won any substantial debt-relief in the first place. One way to explain this anomaly is by assuming that the Syriza leadership simply thought that taking any path out of the Eurozone would be too onerous for Greek workers and capitalists. Greece in this period was definitely inundated with terrifying images of a post-euro world without petrol, without doctors and medicines, without food, in short, a wasteland of repression, illness and violence…a Mad Max world, Greek-style. But there was already a model of an escape from such a scenario in the more than 40 Social Solidarity Health Clinics (SSHC) that could be found in most of the cities of Greece. Most of these SSHCs were founded in the crisis, especially after the Syntagma Square occupation in 2011. They now involve thousands of doctors, nurses and pharmacists and they see tens of thousands of patients a year. They provide first level health care from doctors and nurses who are working for no pay. They began with the crisis to work with immigrants who were often turned away from public and private hospitals. Greek patients in the SSHCs were few because they (even if poor and uninsured) tended to avoid them since they assumed that anything that served the immigrants must be of low quality. But as the crisis deepened and more and more Greeks were laid-off, increasingly the patients in these clinics became more integrated at the bottom of the wage scale. Throughout Greece the SSHCs have become a remarkable pole of attraction in recent years, and they have played an important role in providing health care services to tens of thousands at a moment when the hospital system was deteriorating due to strictures on public investment on social reproduction. At the current situation of intensified deregulation of our lives, as in recent years, the Solidarity Clinics have been a Social Safety Net. The only one in such a broad scale. And this is a fact which cannot be appropriated by any government, party or official institutional body. The fact that we continue to operate has nothing to do with an expectation to get things done as it was before. We have nowhere to return to. And this is a conscious choice. In any situation of political and social instability we know that today we have the social relationships and the necessary experience to maintain an active role in social developments. We do “community medicine,” but it needs to be enlivened by new thinking and this new thinking must come from the patients. But it takes time to get new thoughts. Moreover, it is difficult to bring patients in for a general meeting. For example, we recently telephoned 400 patients to come to a meeting to discuss the project and only 30 came. But still, we are not a philanthropy! We were originally driven to do our medicine out of need, but soon we started to deal with medicine in a political way. We are formulating a third way of delivering health services (i.e., neither in the state mode nor as a private enterprise). We are thinking we are doing medicine as a common and we are using other terms—like “autonomy” and “real democracy”—as well to describe the kind of medicine we are trying to do. We have a problem with the left-wing government of Syriza, even though many thought it would save the situation, But that has not happened. In actual fact, the uninsured are the majority in the country. No solution. And even when there is government support, it requires too much paperwork! People become tired. At times we feel that some of our colleagues are doing the work out of duty. They don’t feel the same way we do. We don’t want to deal with the state. We don’t want to comply with the state’s directives. The below statement is from the Social Solidarity Clinic in Iraklio who are collaborating with other clinics, social centers and movements to create a network from below to receive concrete forms of solidarity. A surprise for some. Not a surprise for others. In either case, there is a lasting question. How is a response from below possible to counteract and negate the totalizing financialization of our lives? There is not one political answer to this. However, a political point needs to be stressed. Support is not needed for an inter-class, ethnocentric peoples—the Greeks. Support is needed for the struggle from below taking place in Greece. It is the State, first, that homogenizes the differentiated impact of austerity—due to class, age, gender, location, and way of life—under a national identity. To accept austerity, for each MoU, a respective national responsibility. And for five years—nationalization or austerity—the two remedies to choose from. We choose differently. What is urgent, for us, is to collectivize (not homogenize) individual risk—due to personal debt, job precarity, lessened or no access to health services and good nutrition and the internalization of guilt and shame. This is the 2nd call for the International Solidarity-Mutual Aid Network. To meet acute and longterm needs in Greece. From/to self-organized initiatives. The aim is to make visible, to demonstrate the efficacy of and put into practice an alternative form of Social Solidarity vis a vis the form of Institutional Solidarity—the EU-ECB-IMF institutions and the new austerity program by the European Stability Mechanism (ESM) of the Eurozone. To clarify. The call is not a contingent choice. It follows our broader effort to develop a different approach to healthcare. On a social, rather than individual, level. Solidarity, reciprocity, equity, without any distinction as to race, color, origin, sexual orientation or religion. Essential elements. For multifactorial healthcare. Not medicalized assessment. For treating human as a bio-psycho-social whole. Not reduction of human to any individual symptom. For deinstitutionalisation. Not charity, medicine for profit, or neoliberal de-hospitalization via closures, privatization and criminalization. For social emancipation. The plan is to start from, and have at the core of this network, autonomous solidarity health clinics—the sites experimenting on the basis of non-capitalist forms of labor, non-medicalized healthcare, non-institutional dependency. Each clinic will act as a hub, and will coordinate with other self-organized groups in its city/broader area. Each such coalition will determine and share with the network—the initiatives responding to the call—a list of needs (money, in kind, human), ways to be reached (online, mail, in person), long term communication framework/programming. There is no one-size-fits-all solution. Needs may range from medicine and electronics to doctors. Within the coming weeks each clinic/coalition will send out their first round of communication. George Caffentzis is a philosopher of money. He is also co-founder of the Midnight Notes Collective and the Committee for Academic Freedom in Africa. He has taught and lectured in colleges and universities throughout the world and his work has been translated into many languages. His books include: Clipped Coins, Abused Words and Civil Government: John Locke’s Philosophy of Money, Exciting the Industry of Mankind: George Berkeley’s Philosophy of Money; No Blood for Oil! and In Letters of Blood and Fire: Work, Machines and the Crisis of Capitalism. His co-edited books include: Midnight Oil: Work Energy War 1973-1992. Silvia Federici is a feminist activist, writer, and a teacher. In 1972 she was one of the co-founders of the International Feminist Collective, the organization that launched the international campaign for Wages For Housework (WFH). In the 1990s, after a period of teaching and research in Nigeria, she was active in the anti-globalization movement and the U.S. anti-death penalty movement. She is one of the co-founders of the Committee for Academic Freedom in Africa, an organization dedicated to generating support for the struggles of students and teachers in Africa against the structural adjustment of African economies and educational systems. From 1987 to 2005 she taught international studies, women studies, and political philosophy courses at Hofstra University in Hempstead, NY. All through these years she has written books and essays on philosophy and feminist theory, women’s history, education and culture, and more recently the worldwide struggle against capitalist globalization and for a feminist reconstruction of the commons. Her books include: Caliban & The Witch & Revolution at Point Zero: Housework, Reproduction, and Feminist Struggle. The former question is very narrow, and this can be seen in the lines claimed by the belligerents in the debate itself. Atheists tend to merely claim that God is a “delusion” concerning a “supernatural being” or a “creative intelligence” hypothesis that has now been exceeded. Monotheists tend to agree (apart from the delusion-and-hypothesis part), viewing the traits of supernaturalism and creative intelligence as the natural conclusions to draw from the various omnies they attribute to God – omnipresence, omnipotence, omniscience, omnibenevolence. This view has a long (Christian and Islamic) philosophical provenance, and aside from being logically fraught, it seems to say more about what Divinity does than what it is. Even labels like “supernatural” tell us nothing other than this being or quality doesn’t fit within our world. It doesn’t stipulate how its own world functions, or how we might identify its effects on this one. It throws the divine outside of this world, specifically to protect it from scrutiny – something atheists are wont to criticise, but never really transcend. All this verbiage is the intellectual equivalent of kicking the can down the road. In short, it seems to me that whole debate is badly posed, and badly understood – even by most theists. They cling to one particular image of Divinity, rather than approach that image philosophically and critically. The reason for this is simple – the importance of upholding the right set of beliefs in Christianity has always been paramount, and is of considerable importance in the other Abrahamic faiths. As such, rather than openly ask the question “What is this Divine thing anyway?”, theists have spent much of their time in the recent past trying to justify other people’s answers (i.e. those of Biblical or Quranic prophets) to this basic question, while atheists have spent most of their time trying to torpedo those same answers. To use an awful academic phrase, nobody is doing any blue sky research. Or nobody participating in the debate is, at any rate. Imagine if we asked the same question of other things. It looks patently stupid if we apply it to physical objects – when Copernicus discovered that the Earth orbited the sun, nobody began to ask “Does the Earth exist?”, after all. But a more telling comparison arises when we think on immaterial qualities. When Charles Darwin discovered evolution, nobody (or almost nobody) questioned the existence of humanity itself as a category. When the financial crisis hit in 2008, nobody asked “Does the economy exist?” This a particularly good comparison to strike, as the economy is very much a product of human artifice – it is imagined, a fiction, “made up” – and yet it has very real consequences for how we each lead our lives. It is quite real. Nobody denies its reality, and although many of us want to see the entire system transformed, root and stem, there is nobody who either suggests that all exchange between persons should be abolished, or that such exchange doesn’t exist in the first place. So even if the atheists were right in claiming that the gods were brought into being by men (and I do not believe they are), that doesn’t necessarily mean the gods aren’t there at all. My approach has always been one of looking to the blue sky for answers; always one of trying to explain experiences I have, rather than attempting to defend a theory somebody else has provided for those experiences. For me, the Divine is as real as joy, power or the colour green – it is something I experience directly. So the question isn’t “does this exist?” but “how does this exist?” How does this relate to the world, of which I am also part? This approach – known in philosophical circles as “Natural Theology” – is not only worthwhile because it allows for free and open speculation towards the gods, of the sort we would use for any part of reality – it also allows us to escape two basic contradictions; one in monotheism, one in atheism; that still dominate popular discourse about divinity. a) Many people have wildly contradictory experiences of “God”. He is alternately male and female, kind and cruel, helpful and harmful, generous and selfish, forgiving and grudging, wise and stupid, immanent and transcendent. One is not meant to be all things to all men, but this being supposedly manages it. b) Still more people – throughout history and around the world, of good character and with no reason to lie – have experiences of more than one god. They meet these beings, work with them, understand them as well as we understand any human person we might meet. Now, the usual monotheist apologetic for dealing with this is threefold: God’s superlative quality means that he not limited by human perception of his qualities; human beings frequently lie, forget, and are deluded about god; and that these other gods who behave in ways unlike the One True God, are actually devils sent to trick us. The first of these three statements is easy to dismiss; special pleading, without evidence – it’s yet more kicking of the can. The second two bear closer scrutiny. Both of these may indeed be true; we know that human beings are indeed fallible, and there may well be devils, if there is a God (ignoring why a supposedly omnibenevolent, just God would permit such convincing frauds to carry on their business for now). My objection, however, is that both of these explanations sound suspiciously like gaslighting. Gaslighting is a means by which abusers twist or manipulate information in such a way that benefits them – denying that a victim’s own experiences of the world (i.e. that social workers, friends, and family are helpful and kind; that you yourself know what’s good for you) are valid (i.e. social workers, friends, and family are all secretly plotting against you; you don’t know what’s good for you – I do). When you consider the behaviour of “God” – the blatant obsession with controlling his followers, the constant threat of (eternal) pain, the desire to police their thoughts, the push to attract more followers, and punish those who disobey, accompanied by the near-constant lip-service towards love and kindness; what emerges is not a kind and loving Father, but a vicious and persistent abuser. In this context, the apologetics of monotheistic theology are unmasked as a rather transparent attempt to separate devotees from those who might otherwise be able to help them – that is to say, other gods, and first and foremost the good sense and genius of each follower in themselves. With this in mind, there seems to be little reason to doubt such an overwhelmingly well-attested report as that of there being many gods; not just as an article of faith, but a vital step towards personal liberation from long-lasting patterns of abuse on a cultural scale. From a reductionist atheist perspective, the gods are just mere imagination – voices in the head, created by some quirk in the evolution of the brain. Primitive man, so the theory goes, personified natural phenomena – thunderstorms, dreams, spring, childbirth – in an attempt to better relate to them. Those who still express this trait are a throwback to this earlier time, before mankind developed reason as a better way of understand the world. In anthropology, this idea was championed by Edward Tylor, who believed that religion was a “survival” from a prior phase of human evolution. He was working in 19th century, and his ideas are now seen as highly antiquated by contemporary anthropologists of religion. But they still prove popular amongst certain atheists – particularly Richard Dawkins – because they serve the same purpose for which Tylor originally thought them up – to discredit religious beliefs. There are some Pagans who, quite happily, base their own practice on this theory; here, the gods are just human projections onto the world, protected from refutation by a postmodern affirmation of personal experience. There is a delicious irony in how a theory devised by a sceptic to skewer religion for good has ended up being retro-fitted as a kind of Natural Theology for a relativistic age. The problem for this reductionist disavowal of the gods is, of course, that lots of other things exist primarily as structures in the brain – not least consciousness itself. Physically speaking, my humanity, that of all the people I know, and the personas of my gods are composed of much the same stuff – neurological matter. If we take a materialist view of the world, my sense of “I” and my sense of “Sulis”, “Frey” or “Nodens” are basically the same mental function – the brain being able to create a particular sensation, in this case, one of persona and agency. We see that this places atheism in a bind; if [a] god does not exist because my experience of it is solely in my head, then my consciousness does not exist by the same token – both are mere shadows on the wall. If we put the gods on the bus, then we will surely join them soon after. What will be left behind are mere bodies; capable of nothing but empty production and consumption, devoid of any meaning or purpose, and easily exploited. This point has been made excellently elsewhere on this blog; but suffice to say, if we kill the gods, then we wipe out ourselves too. The claim that gods do not exist because we imagine that they are there, also indicates that our own consciousness does not exist, because we imagine it is there. Here, we have taken the measure of the two conventional stances taken in the debate – that of conventional Monotheism, and that of conventional Atheism. Both, as we have seen, are blighted by fundamental flaws, that conflict with the commonsense view of reality – monotheism is contradicted by the fact that many gods have been met by humans; the flat out denial of the gods on the basis that they are imaginary would also require denying humanity as a “delusion” as well. So how might we construct a more robust, natural theology? We know, from a vast array of historical and personal evidence, that gods exist. They are awesome, powerful, and long-lived beings. From the second contradiction, we know that the gods share their interiority – in some degree – with humanity. From the first, we know that they can lie. Many of them appear to be embodied by natural forces and features of the landscape. Others are connected with forces and powers that are found within human society – like love, and war, and victory. They are mortal. They can kill. And they can lie. Humans can become divine through theosis, and gods can become human through incarnation. From a moral perspective, gods seem little different to human beings; some are good, some are bad, all have virtues and vices. As such, we should approach our relations with them in much the same way as we do with one another – showing respect, giving credit where credit is due, and avoiding those who give the signs of being abusive or cruel. Gods may be much wiser than we are, much kinder, much braver – but they are still people, and so, they might not. We must use our own discretion, and that of those we trust, to be sure. The relationship divinities have with their physical manifestations appears to be the major difference they have with humans. Simply put, humans are tied to and defined by our mortal bodies, in a way that gods are not. We find mirroring of this in the ancient texts, where what marks humanity and the gods apart is not their power, their supernatural station, or their cosmogonic role – indeed, humans often fill these roles too – rather, it is the fact that they eat food that makes them immortal. Ambrosia or apples or the bread of life; it makes no difference. Because they are not tied down by life as we are, they can extend far more broadly throughout time and matter; so that, as Thales once said “All things are full of the gods”. Man, sadly, appears to be mostly full of himself. It is often said that if you ask 10 Pagans to define Paganism, you will receive 15 different definitions. It is certainly true that Pagans do not have a common body of literature or a single set of ideas that define the essence of what we think and say – although, there have been attempts to establish such a framework. Even so, priding ourselves upon how we celebrate differences of opinion, and over how we are prepared to open our minds to other truths; Pagans as a rule are highly resistant to orthodoxy of all shapes and sizes – indeed, for many of us, an overemphasis upon revealed, absolute truth is what drove us away from established religion in the first place. Even though certain traditions are strict upon what counts as their tradition, you must go a long way to find a Pagan who refuses to – at the very least – accept the right of others to differ in their views. What place, then, could heresy even have within Paganism? If the basic Pagan impulse is to be as disorganised and diverse in our religious opinions as possible, what usefulness is there in a word that serves only to describe forbidden, or controversial religious thought? In truth, heresy is a vitally important concept – both in terms of its history, and in terms of its present-day usefulness – for Pagans to understand. Heresy – like many components of religious thinking – contains a fruitful paradox. Because what lies at the heart of this concept is not – as we might assume today – the intolerance of Inquisition, and the heat of a burning stake, but rather something that is vital for all Pagans to embrace; a firm commitment to truth. It is well known that although the Ancients gave us many of our most rarified words, what is less widely acknowledged is the extent to which modern definitions vary from how the Greeks or Romans would have used those same words. “Evoke” for example – today used for the gentle act of calling something to mind, or in magical circles to bring a god or spirit present without it being embodied (c.f. “invoke”) – comes from evocatio; perhaps one of the most evil pieces of Roman War Magic, where the gods of an enemy nation were literally “called away” from the people they knew, and co-opted to the Roman cause. “Person”, a noun that refers to the very essence of who were are as living, social beings, comes from the Ancient Greek πρόσωπον – prosopon – meaning a mere mask, for use in theatre. Heresy comes from another Ancient Greek word – αἵρεσις – or hairesis – meaning “choice”. It referred specifically to the process of deciding how one would live; by choosing between one of the various philosophical schools active in Ancient Greek and later Roman society. Would you seek happiness through the Epicurean quest for balance in all things, or would you opt for the Stoic approach of living in accord with Natural Law? Would you go mad for numbers with the mythical Pythagoras, or was union with the gods more your bag, like Plotinus? This choice was, largely, a free one – there was no one philosophical school that reigned supreme; each had their virtues, and the right of exponents to follow them, and seekers to choose between them was largely respected. Over time, the moral authority of such considered choices started to wane. Such philosophical introspection was predominantly an elite activity – poor people, women, and slaves were almost always denied the opportunity. As the urban population grew and the Axial Age and the Empires that came after wore on, people lost their faith in the great thoughts of noble men, and started agitating for new, stricter, universal truths that applied to everyone – embodied by the faiths of Christianity, and Islam. Over time, truth became doctrine, choice became fraught, and αἵρεσις became heresy. The impact of this shift in changing how Europeans thought about all matters religious cannot be overestimated. It didn’t just change the content of what Europeans believed, but it changed how they asked questions about and reflected upon that content too. To put it simply, Christianity introduced a compulsion in the realm of philosophy – a series of fixed points, that had to be reconciled with the facts and reason, come what may – that had simply not existed to the same extent previously. But the transmutation was not total; there is a common thread that links Christian heresy and Pagan αἵρεσις together. Both are profoundly concerned with a commitment to the truth; to seeking it, exploring it, accepting it, defending it. What for Pagan elites was a personal journey, fueled by a singular desire to excel amongst one’s peers, for the Christian church is a matter of internal unity and consistency. 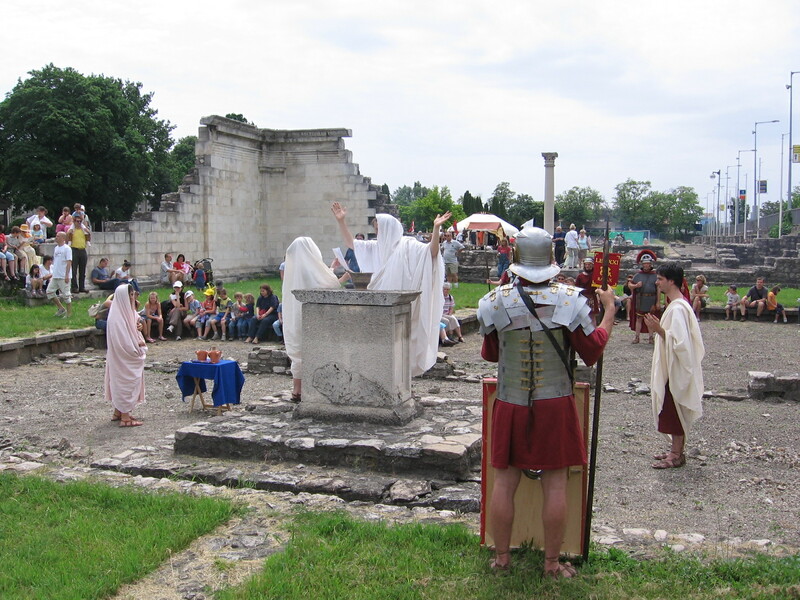 The same push for political conformity and obedience that eventually killed Socrates – a controversial, and extraordinary event for its day – became far more developed, extreme and frequent in Medieval Christianity. Over time, in order to distance itself from these compulsions (and avoid ecclesiastical censure) philosophy came to to distinguish itself from spirituality entirely; leaving the great Ancient Greek and Roman thinkers to be reclassified as fathers of various academic disciplines – with the clear and blatant theological and spiritual content of the work of writers like Aristotle and Plato being largely neglected in their secular hagiographies, despite it being well known to intellectuals. It should be stressed that this divide – between (religious) theology and (secular) philosophy – is a varyingly porous one within the academy. But the former gulf between the two can still appear, particularly in wider society: where theology is imagined as a space where absolute truths are defended intellectually (descended from the entirely religious Abrahamic tradition), while philosophy is construed as a forum where all truths are systematically questioned (descended from the totally un-religious Indo-Hellenic tradition). In short, theology is felt to disallow heresy, while philosophy is seen to celebrate it. Paganism, of course, with it’s commitment to free choice in matters religious, appears to subvert this dichotomy. Considering how a free choice in how one leads one’s life is intrinsic to the ancient meaning of heresy – as αἵρεσις – one might imagine that contemporary Pagans would be as drawn to philosophy as their Ancient predecessors. Now that literacy is a near-universal skill, and that now a much wider swathe of society has access to the sort of learning the Ancients reserved for the few, there seem to be few obstacles to such an endeavour. And yet, with a few exceptions (including some excellent articles on this very blog), there are very few Pagans out there doing philosophy. Emma Restall-Orr’s Pagan Ethics, which also highlights the ancient origins of heresy in notions of choice, is one such exception. But Restall-Orr neglects to explore why – despite the profound commitment of many Pagans to a diversity of opinions, the doubtless intelligence of many Pagans, and our common roots with academic philosophy in the Classics – the fact that she is one of the few authors to write explicitly in this genre. One reason – I suspect – is the imagined divide between theology and philosophy. There is no established landscape – outside of the ivory tower-guarded, academese-ridden morass of “interdisciplinarity” – between the two. Into this chasm, I fear, Pagans have dropped the concept of heresy – and therefore lost all sense of what it is about. Although this discarding of heresy has put an end to religious persecution, despite the various controversies that have erupted over the years regarding historical authenticity, reconstruction vs. syncretism, gender binaries, and the ontological status of divinities, it has also blunted our commitment to truth. We don’t do philosophy as much as we might do, because as a community we’ve lost sight of why philosophy – and truth itself – might be important or useful. In the next series of articles, I’m going to write on a variety of philosophical topics. I do this not as an academic, nor as an expression of absolute truth, but as an intellectual exercise – for the reader, and the author. Pick apart my ideas, dig holes in what I have written. Reflect, ponder, and rebut. Hone your commitment to truth; for it is the pursuit of heresy – motivated by our desire to know – new discovery abounds. A couple of years ago, I was cutting up a yew tree in my parents’ back garden. As often happens when I labour physically, my mind started working too – as if to create a state of harmony between the two. And while I hacked away at the yew-tree that my dad had just felled, a chainsaw he found in the electric chainsaw reviews I showed him. I started musing about how justified we were in killing the tree. It wasn’t producing many berries due to being overshadowed by other trees, it was starving out the plants that were growing below it, and the shelter it offered small birds could easily be provided by other, more broadly beneficial plants. 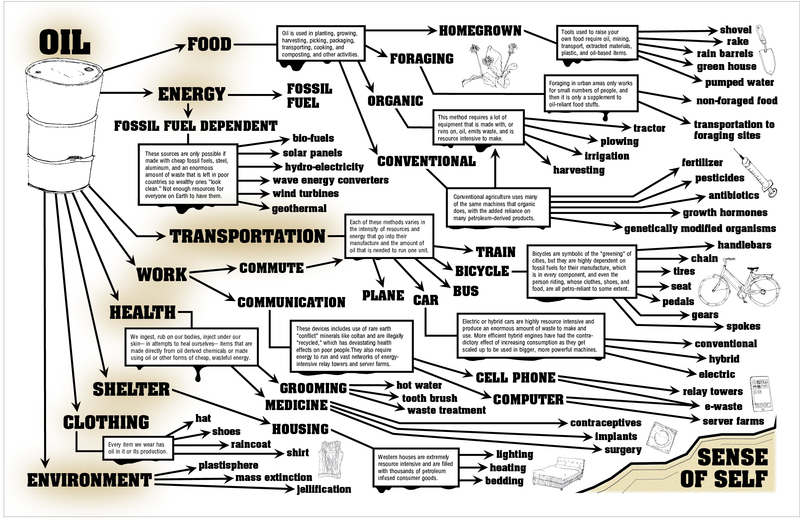 These broader, ecological reasons were what lay behind our work that day. But while my mum and dad started expressing their enthusiasm for what we were doing, commenting on how much nicer the garden looked with the yew gone, I considered how – for most other people – this would be enough of a justification to get rid of the yew in the first place. The yew’s own life, how catastrophic it would be for the yew to be killed, wouldn’t even be a factor for consideration. As far as most people are concerned, if humans benefit from the death of a tree, it’s justified. The materialist logic behind this is simple – human beings are able to experience neurologically sophisticated forms of pleasure, while yew trees, as entities lacking brains, are not. Therefore, humans like my family would gain far more from chopping a yew tree down and admiring the view, than the yew tree would from continuing to live. Our big brains allow us to set the agenda of what is useful, and what isn’t – and therefore, what is morally justified. Of course, even if you believe that human benefit is the only significant kind, that still gives you plenty of reasons to conserve our natural heritage. The human reliance on the natural world is considerable, even if only reckoned in rather narrow economic terms. Of course, this doesn’t even touch upon the level of spiritual, aesthetic and emotional satisfaction human beings derive from their environment. Nonetheless, anthropocentric forms of conservation and environmentalism have been frequently criticised by certain thinkers (such as the deep ecologist Arne Naess, Val Plumwood, and others) for being “shallow” and not addressing the underlying attitudes that lead to ecological abuse. Such critiques reveal a basic difference of opinion in the Western world. Some people – romantics, nature writers, and Pagans – assume that ecological abuse is just simply a bad thing, something that the other camp – including most of society– simply doesn’t accept. This disagreement is utterly fundamental; the former have no reason to doubt the rightness of respecting all life, the latter need no reason to believe it. Even when you do come across conservationists of the latter view – and there are many – they see nature primarily as something that helps or supports mankind; the protection of the Earth is reasonable, because it benefits us. If the situation came down to saving the Earth or saving humanity, then the average shallow ecologist would, like Bruce Wayne from Batman & Robin in this scene, do the latter. Although Poison Ivy is clearly a villain, in smoothly remarking that “People come first, Dr Isley” – instead of treating both as a single community in need of protection – Bruce Wayne is a monster. A utility monster, to be exact. Simply put, a utility monster is a being who derives greater pleasure from consuming a given resource than any human – they can even, for example, obtain ever increasing levels of pleasure. This pleasure-generation machine of a creature would, in theory, be perfectly justified in consuming the world, the universe, anything and everything, because the amount of pleasure it would gain from doing so would outweigh any suffering that such consumption would produce. Capitalist society transforms humans into utility monsters – beings whose capacity to benefit from resources is perceived to be much greater than that of another other class of being, and indeed our capacity for pleasure is assumed to be inexhaustible and ever-increasing. This is codified in the so-called “fundamental economics problem” – that humans are beings of infinite wants in a world of finite resources. This is made possible by how utility itself is defined: as the sense of pleasure created by the human brain, and solely by the human brain. Narrow utility of this kind gives humans the right to consume indefinitely, even when such indefinite consumption harms non-human beings. Indeed, it renders narrow utility part of the furniture of modern day thinking. This ultimately creates a rather bleak moral universe. In this particular vision of the world, we have a tyranny of the best-evolved to be happy. Species exist with a significantly more acute sense of pleasure than other species, and that in cases where conflicts of interest arise, the “maximally pleasurable” are able to ignore the interests of those who feel comparatively less pleasure. The outcomes would be grim. Look at the Hollywood film Independence Day. It’s very clear from watching this film that humanity are meant to be the good guys – defending their homeworld and fighting for their very survival against a fleet of uncompromising alien invaders, who want nothing less than to destroy the entire planet, consume its resources, and move on. But what if these aliens have a far stronger sense of pleasure and pain than humans do? What if they would gain much greater benefit from consuming our planet than we would from living on it? The fiery annihilation of the mother ship would be the source of massively greater suffering than the wholesale elimination of the Earth’s human population, as the beings being killed in the former have a far greater capacity for feeling than the beings in the latter case. Looking at it this way, the scene where the US President confronts an alien pilot gains a sharper moral point. The alien is no more or less uncompromising than humans are when faced with a shoal of cod or a stretch of Amazonian rainforest. Imagine what the alien is thinking – Mine is a people that has travelled the stars for millennia. We have mastered the fundamentals of the universe. We see, feel and understand the world in ways your species could not imagine. What could you possibly offer us alive? You might consider this to be a hugely speculative example, but it has a distinct precedent – European colonisers exacted similarly parsimonious standards of value when interacting with indigenous communities. Though such interactions occurred across a much smaller gulf of experience, a moral principle is a moral principle. So long as one person experiences greater pleasure or pain than another, there is a moral hierarchy, that can be used to justify cruelty and exploitation. The manifestly repugnant nature of such acts – from the real (colonialism) to the imagined (alien invasion) is proof against the kind of utilitarianism that underpins both the aliens’ attitude in Independence Day and shallow ecology. One merely has to ask; what sort of universe would a universe of utility monsters be like? The answer, it seems to me, would be an unpleasant one. There would always be a bigger fish – a nastier, more powerful entity out there who could destroy you utterly, and be perfectly moral in doing so, because it could derive more pleasure from the act than you would suffer from it. The aliens of Independence Day might be able to justifiably destroy us for their own gain, but they could just as well be justly devoured by a gigantic voidworm orbiting around some dark, forbidden sun. So although on a basic economistic level this stance might make sense, the sort of world it would create means that it doesn’t make logical sense for any moral agent to pursue such an approach. Of course, a world where everyone gets a chance at happiness would have less overall utility than a world of utility monsters. So why is it better? The critical factor here is the relative nature of value. All value is relative to the person experiencing it. Therefore, just as the annihilation of mankind is catastrophic for us, but barely of consequence to the aliens, so the felling of a yew tree might be barely of consequence for the lumberjack, but be of terminal significance for the tree. Whether it “feels” pain, fear or despair as we do is irrelevant – on its own terms, dying is hideously bad news. There can never be, therefore, a universal standard of utility. So how do we prevent ourselves from becoming utility monsters? Simple – we take the motivations of all other beings, such as they are, into account. This doesn’t amount to a crude anthropomorphism, in which trees are assumed to be humans, but instead requires a basic sense of empathy, even for those who fundamentally Other. The assumption of universal utility is replaced with a respectful acknowledgment of all existences that must always be sensitively responded to. Of course, this doesn’t mean we can no longer cut down trees, harvest crops or take antibiotics because of the lethal consequences of such acts, but we simply can’t afford to ever forget, or be cavalier about those consequences. Lest we become monsters.